« Mustang Introduces Deluxe Super Touring for 1997-07 FL. More Room For The Driver. Published by Cyril Huze July 7th, 2017	in Editorial, Events and Racing. Pappy Hoel, the Sturgis Motorcycle Rally’s forefather, will have his vision for motorcycling in the Black Hills honored with three national half-mile championship races and an authentic dirt drag race open to Pre-1970’s vintage motorcycles, all based at the very same track where it all began back in 1938. “From touring the beautiful Black Hills on an old bike, to watching the thrillingly fast and exciting vintage racers compete for the Spirit of Sturgis championship title, Sturgis, a world renowned motorcycle town was built upon a multifaceted weekend of motorcycle racing. It’s a blessing to be flat track racing old bikes, still to this day, on a grassroots half-mile race track that directly played a major part in the history of Sturgis, South Dakota,” states Brittney Olsen, antique motorcycle racer and co-founder of 20th Century Racing. The Sturgis Motorcycle Museum proudly kicks off the rally this year with the Pappy Hoel Speed Classic Pro races on Friday, Aug. 4 and their national vintage races on Aug. 5 at the Meade County Fairgrounds located at 1802 Ballpark Road, the same location as the Spirit of Sturgis Festival. Proceeds from the museum’s races and event will go directly to the Sturgis Motorcycle Museum building fund. 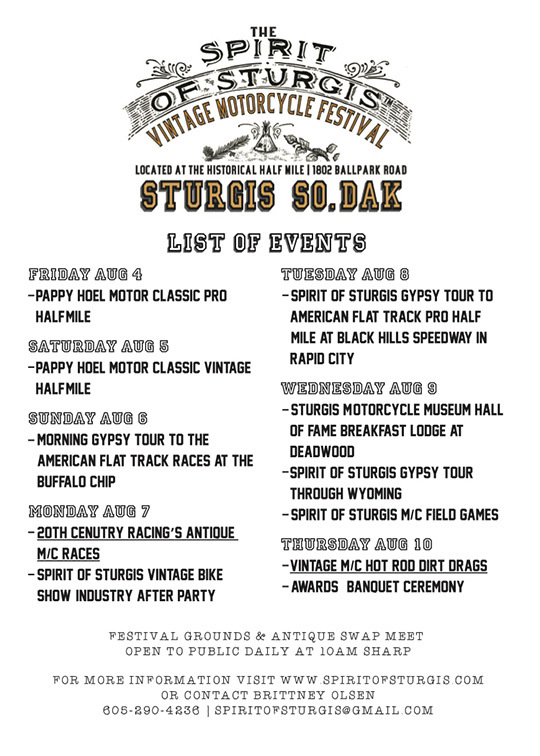 On Monday, August 4, the vintage festival commences with the prestigious Spirit of Sturgis Antique Motorcycle Races hosted by 20th Century Racing and in conjunction with Steve Race Racing. The opening ceremonies begin at 4 p.m. sharp. 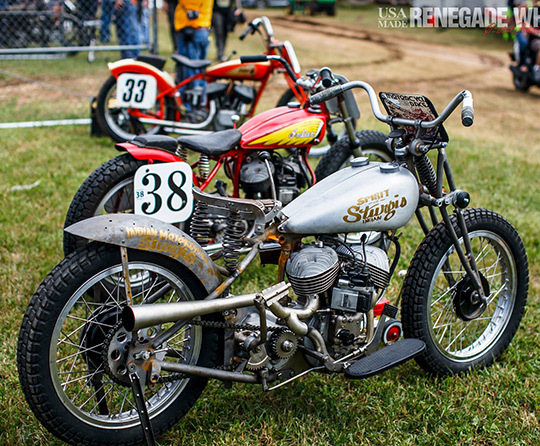 Witness before your own eyes the fastest, oldest motorcycles racing in Sturgis with board trackers from the early 1900’s to the ‘20s as well as Class C hand-shift racers from the ‘30s and the flying vintage twins from the ‘70s & ‘80s! 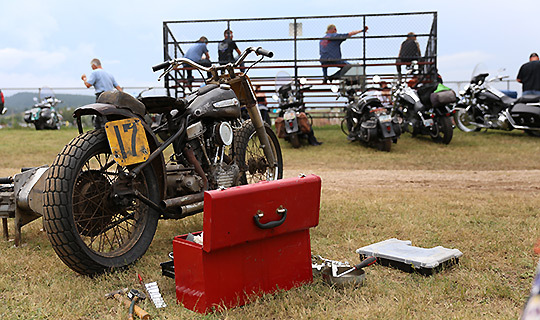 Fans are invited to an after party and vintage bike show immediately following the antique races on Monday evening at 7 p.m. at the historical Sturgis Half Mile. Come join the top finishing champions and their historic racing machines alongside some of our country’s most beautiful antique and vintage motorcycles at The Spirit of Sturgis After Party and Show. In conjunction with the bike show, 20th Century Racing is hosting a special industry party at the historical Sturgis Half Mile. Supporters of the 2017 Spirit of Sturgis Vintage Motorcycle Festival will have the opportunity to have an all-access pass to the event grounds, races and after parties. You can purchase tickets for admission to the races, party and pit passes in advance online by going HERE . Racers can register online at Spirit Of Sturgis . The Spirit of Sturgis Vintage Gypsy Run, geared towards bikes 35 years or older, will lead up to Tuesday’s featured main event, the American Flat Track Pro Half Mile Race at the Black Hills Speedway in Rapid City, SD on August 8. There will be two exciting routes to choose from. A scenic paved route or a gnarly unpaved route on gravel. Routes start at the Iron Horse Saloon and kickstands go up at 4 p.m. sharp. Riders can pre-register HERE for the Gypsy tours. The morning of Wednesday, Aug. 9, begins with the famous Sturgis Motorcycle Museum Hall Of Fame Breakfast at the Lodge At Deadwood. The final Spirit of Sturgis Gypsy Tour will leave from the Lodge At Deadwood, heading west and winding through the beautiful landscape of Wyoming. 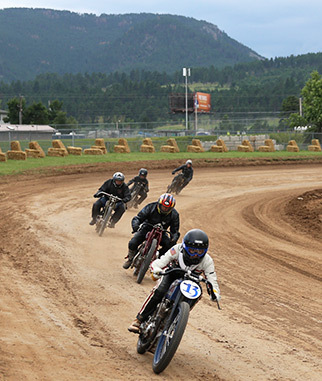 The Spirit of Sturgis Vintage Motorcycle Festival will wrap up Thursday Aug. 10, with authentic hot rod & vintage motorcycle dirt drags, flag girl and all, down the front straight away on the historical Sturgis Half Mile Racetrack. The grandstand gates will open to spectators at 10 a.m. and racing will begin at 12 noon. The Spirit of Sturgis is proudly sponsored by Indian Motorcycle Sturgis, 20th Century Racing, Sturgis Motorcycle Museum, The City of Sturgis, Carl’s Cycle Supply, The Moto Film Fest, The Oil & Ink Expo, Russ Brown Motorcycle Attorneys, Talking Motorcycles with Barry Boone and The Black Hills Chapter Of The Antique Motorcycle Club Of America. The organizers of the Spirit of Sturgis Vintage Festival kindly request all supporters be supported, thanked and acknowledged. For more information please contact Brittney Olsen at 605-290-4236. GET OUT THERE AND SUPPORT THESE VINTAGE EVENTS BOYS AND GIRLS.!! This is where the Sturgis Rally has it’s beginning. AGREED. These events are so much fun, its awesome to see the vintage bikes out there on the track. SHOW SOME SUPPORT VINTAGE RIDERS.THIS IS ONE OF THE EVENTS YOU HAVE BEEN LOOKING FOR.